From the first day at the new house you show the pup where he should sleep. It either can be a blanket or a dog-basket. The pup will accept this place after a real short period of time as his. He will go there to sleep and rest from playing. It is not good to wake the pup up while he is sleeping. You also should get him some toys he can play with. Do not use toys, which could be dangerous to the pup, such as objects he can bite pieces out of and swallow. Also you should buy him a so called "tug toy" or "puppy tug". This toy you should not give to him unattended. You only use this toy when you want to play with the pup. You throw the "tug toy", let him get it and bring it back to you, then you let the pup pull on it, but always let go of the toy, so the pup "thinks, that he won this game". You can play with the pup in such way for a few minutes, then you have to stop. Puppies are like children, they get distracted and bored very easily. You always should make the play exciting. There is another reason why you should play with the puppy. You show him, that you start and finish the game. If you play too long, the pup will finish it, because he gets bored or other objects around him interests him more. If you keep the play short, this will build up the pups play-drive. This can be very helpful, if later on you want to train him as a working-dog. You can even hide this "tug toy" and let him find it. It also has some training aspects. It will show the dog at an early age, that you are the leader and not the dog. Especially with a male dog you have to show them in an early age who the "leader" is. When you feed our dog, he also will have to learn to wait until you give him his food. While he is eating you sometimes should take his bowl away from him, if he does "growl at you", you make sure that you do not tolerate this behavior. You have to correct him with a harsh "no", until he stops. This is very important. If next time you take the bowl away without him acting up you immediately PRAISE him to show he done right. If he has a bone or a play-toy or a stick you also take this away from him at times. No matter what the dog has, he has to give it to you whenever you tell him to. No matter what the pup is doing or where he is laying, you always should be able to "pet" him without him reacting against you. At times he might not want to be touched and will show this to you by "growling" etc. Again this behavior you should not tolerate. If you have children, you have to let them know, not to disturb the puppy in his sleep. The pup will not accept the child as his "leader". So he will probably show the child this by nibbling at him or her. The child has to know this and should not push himself on the pup. The dog should not be a toy for the child, which the child could play with whenever she or he wants to. Here we have to look again and see how the pup would behave in a pack of his own kind. In a pack only one dog can be a leader. You as the new owner should be the "leader" for your dog. Your child is like a littermate to the pup. The pup feels the weakness in your child and therefore will never accept him or her as his "leader". You have to know this to understand some reactions of a puppy towards a child. For example, if the pup does sleep and does not want to be disturbed and your child is trying to do so, the pup will show your child in his own way "leave me alone" and this would be probably with his teeth. He would do the same to his littermates or other young dogs in his pack. I want to show you with this simple example, that you should always get more knowledge about the dogs wild life in a pack in order to understand your pup at home. Do not treat the pup like a human, treat him like an animal, teach him manners, be consequent, but with knowledge for his needs. Explain this to your child. If you do so, then your child will have a friend forever, which will bond with you and your family and out of Shepherd instinct protect you all. Here are a few helpful tips on how to teach your pup manners around the house. If you want to teach your dog to lay down, you put a treat again in one hand and point your free hand towards the ground. If he is on a leash you can pull also a little bit towards the ground until he lays down, then give him the treat and praise him. The command "lay down" should not be enforced on a young dog under the age of nine months. If you enforce this command at an early age, it can be negative for his self-confidence. You do not want to take any chances to break the dogs spirit during his raising. Dogs under nine months should be taught manners and should not be trained. At home you teach the pup all these commands in a playful way, you teach him "sit", "lay down", "stay" and of course "come here". Your dog must come instantly when called. This in my mind is the most important lesson, which you should teach our puppy in an early age. This lesson you can and should enforce. You put the pup on a thirty feet long leash, let him roam around and then call the command "Here". Of course he will not follow your command, unless you practised this before in the house with a treat. Then he probably comes, because he knows he will get a treat. But when you are outside with your pup, by nature he usually will be distracted by other objects. Therefor you have to enforce him to come to you. You will tug, but not drag on the leash until he turns around and comes to you. When he does he gets his treat and your praise. You have to repeat this every day at different places. Later on you can take the leash off and try it without. If he does not respond right away you have to start all over with the leash again until he does it correctly. One thing you should know: If you call your dog and he does not come right away, you should never punish your dog once he came back to you. If you do this, he will always remember this. This behavior from you creates fear and the pup will not trust you again. You can only correct the pup with the leash in the above explained way, while he is far away from you, but once he came to you, you have to praise him. If the dog gets afraid of you, he will never do the lessons without fear. Always remember this! Altogether you should teach your pup following manners: "sit", "come here" and "stay" (like if you leave the house and he has to stay, or if you go in another room and he should stay out). After the dog is about ten months old you should be able to walk him on a loose leash without him dragging you in every direction and he also should stand to be petted without jumping up and face biting. These manners allow you to live comfortably with your dog. More is not needed in the first year. The pup will be confronted with other dogs, but does experience them from a distance, even if the owner tells you that their dog is great with puppies. A pup at this age should not have bad experience with another dog. If it would happen it will be in his mind for a lifetime and even in some cases he has trouble getting along with other dogs once he has grown into an adult dog. 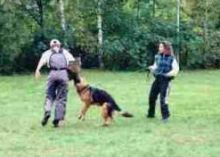 Also at these training-places he will get the chance to be around different adults, he will get used to be touched by different people, he will see "schutzhund work" done by adult dogs. When you go to a training place you should take your pup out in the field and start playing with him. You should use his "tug toy". It should be done at least two times a week. At this age you should never do any obedience, you just let him be a pup and play with him to build up his play drive. If you do as above explained, your pup will experience children, adults, different situations and objects. 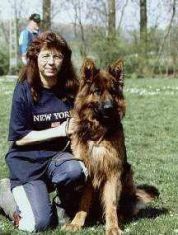 This will be the best foundation for a good family dog and also be worked in "schutzhund". 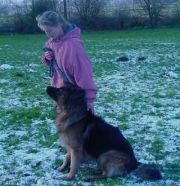 If the pup shows good play-drive later on the helper from the training-place will continue what you have built up. Instead of your little "puppy tug", he will use a big "puppy tug" and work with your young dog for another few weeks or months as its needed. If the young dog shows progress, then a good helper usually knows when it is time to chance this "puppy tug" into the "young dog sleeve arm". A good helper will go with us step by step as the young dog turns into an adult. What does a good helper do? How can you recognize one? First of all a good helper will play with your dog, he lets him win by giving him a chance to carry the sleeve arm around the field, then gives the owner a chance to take it away from the dog. A soft stick can be shown to the dog, but never should be used, until the dog matured and shows a lot of self confidence. During his play, he will never corner the dog, he will always show himself as the "prey". After the young dog shows a good drive and is above one year old, you can start with obedience training. The German Shepherd with a good build up play drive is so motivated to work, that it is difficult to hold him back. Keep your sessions short and focused. Have a definite plan. Then when you do go out to work, get it done swiftly, in high drive and get off the training field. Never let your dog go down in drive during a training session on the field. Take many months to teach him his commands. Do not push the dog too fast. If you do so, you will have a burned out dog, that will be working for only a few years. Better is, that you take your time with your pup to produce a solid foundation while allowing the pup to mature. 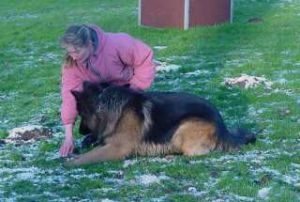 This will give you a dog that will be your partner for many years to come, either in "schutzhund work", "rescue" or "search". The key to raising a pup and training an adult dog is patience. You must have a great deal of patience with a pup and realize that they do not have the knowledge and understanding to be "good". They must be guided just as you would guide a child from infancy to adulthood. This is the reason why I wrote down the above tips in how to raise a puppy, teach him manners and later on train your dog. I want to assist you in raising your pup through the first couple of years. I want to show you how to create a working partner, that means the world to you. If questions now or in the future do arise, do not hesitate to ask. I will try to answer them by e-mail, letter, phone etc.